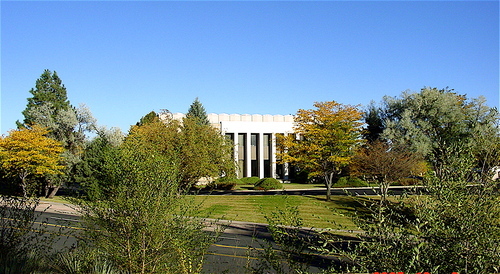 The Temple Occupying the center of the beautifully landscaped site on the brow of a hill west of the city, the building is oriented due east and west so that the symbolic East in the lodge rooms is also true east. Ample parking spaces are provided for even the largest gatherings. The front range of the Rockies dominated by Pikes Peak provides a beautiful scenic backdrop to the west while the city with its diadem of lights each night spreads below to the south and east. The Temple fits well into this beautiful and unusual setting. Its exterior walls of soft mellow tones of Colorado flagstone combine with precast panels of exposed quartz aggregate which rise from the entablature of concrete and complement and blend with nature's colors in the surrounding terrain. The new Masonic Temple was constructed at a cost of approximately one and one-half million dollars including furnishings and landscaping. It consists of two floors as well as a partial basement. The South Stairway Of particular note are the large paintings hanging above the land­ings of the stairways. The painting over the south stairway is a repro­duction of an original oil portrait of George Washington as Master of his Lodge, painted by Hattie E. Burdette at the request of the Congress for hanging in the Capitol of the United States. The original was later moved to the George Washington Masonic Memorial in Alexandria, Virginia, where it now hangs. The reproduction, made from a small copy of the original so skillfully that many consider it an original, was presented to the Build­ing Society by friends and brothers of Leon Snyder as a tribute to his dedication to the building of the Temple and in response to his expressed wish that such a portrait have a prominent place in the building. The North Stairway Over the landing of the north stairway is an original oil painting presented to El Paso Lodge in 1909 by Brother Verner Z. Reed. Painted by Henry Salem Hubbell (1870-1949), a distinguished American artist whose works appear in many international galleries, the painting is entitled "THE RETURN." It obvi­ously depicts the return home of the errant daughter seeking the blessing of the village priest and the forgive­ness of her parents. Other than being a beautiful painting by a dis­tinguished artist, it lacks any signifi­cance in relation to the fraternal building in which it hangs. The elaborate frame is attributed to Tiffany. The Egyptian Lodge Room Entered through the Tiler's room flanked on the north by a prepara­tion room and on the south by examination rooms, the Egyptian Lodge Room, an outstanding feature of the Temple, occupies the north side of the second floor. 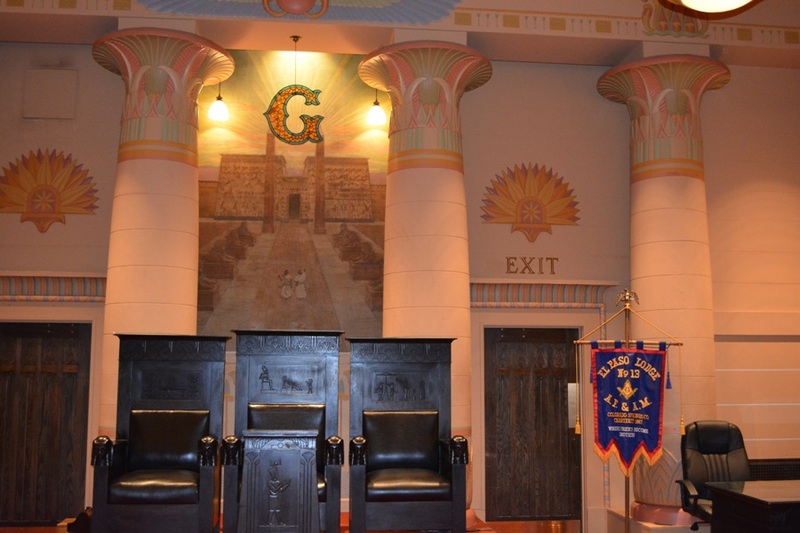 This room which seats 112 is not only an exact replica of the nationally famous lodge room in the Temple at 9 North Nevada Avenue but is actually constructed of the columns, ornaments, and other features removed from the original room. 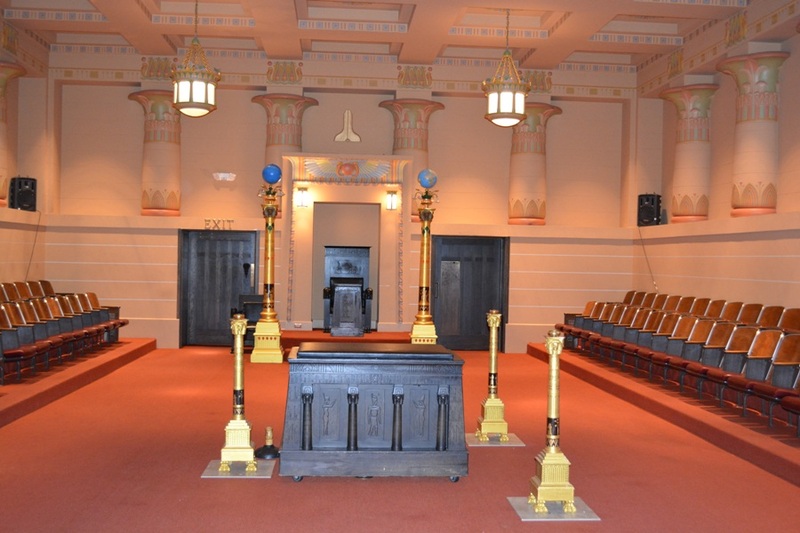 The altar, officers' chairs, and podiums as well as the seating are all the original furnishing from the Temple at 9 North Nevada Avenue. 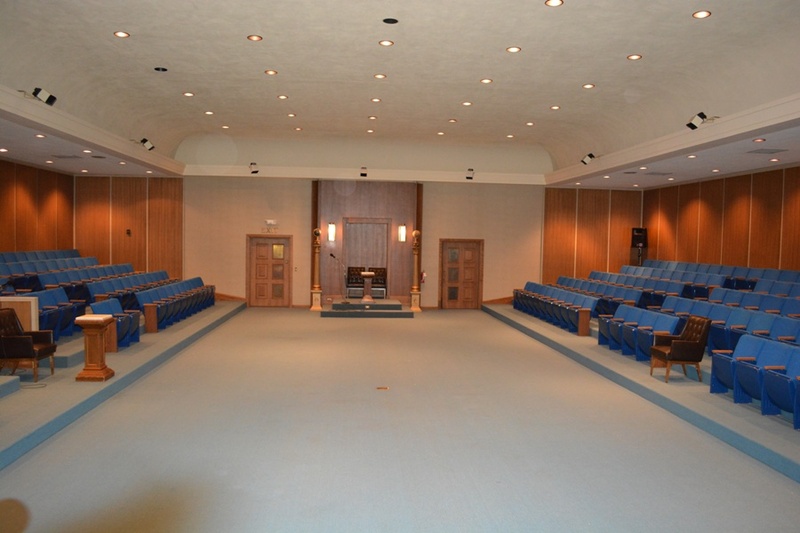 The American Lodge Room On the south side of the second floor is an impressive and spacious room with 269 fixed seats on the north and south. The walls are of oak paneling and the master's station in the east is backed by a wall of Roman Travertine marble framing a panel of antique gold Venetian mosaic tile and flanked on each side by doorways crowned with batteries of gold organ pipes. Plat­forms in the northeast and southeast corners of the room contain the organ console and a piano. The vaulted center portion of the ceiling is illumi­nated with cove lighting as well as direct down lights. The lighting in both lodge rooms, which in each case is subject to dimming, is controlled at an illuminated panel adjacent to the secretary's desk. At the east end of each lodge room are ante-rooms and costume and make up rooms. 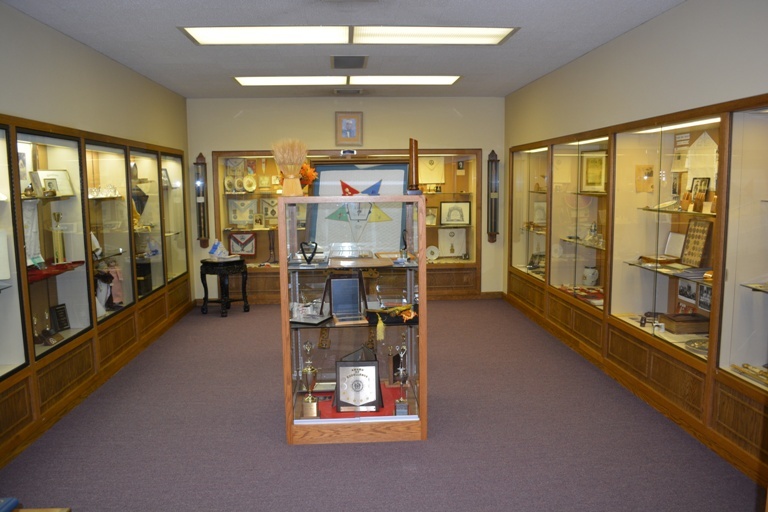 The balance of the east end of the second floor is a series of paraphernalia rooms with one assigned to each of the participating organizations. Colorado Springs Masonic Building Society Originally incorporated in 1907 for a term of twenty years, the articles of incorporation described the purpose of the Society as follows: "to acquire in any lawful manner and to own, hold, lease, let, operate and convey real estate and to erect, maintain, equip, furnish and operate buildings and improvements thereon, and to use, let, manage, enjoy, sell, mortgage and otherwise dispose of the same." In 1922 the articles of incorporation were amended extending the life of the corporation another twenty years, and in 1947 a further amendment extended "perpetually" the life of the corporation. The current By-Laws of the Society were adopted in 1973. Three Blue Lodges, El Paso Lodge No. 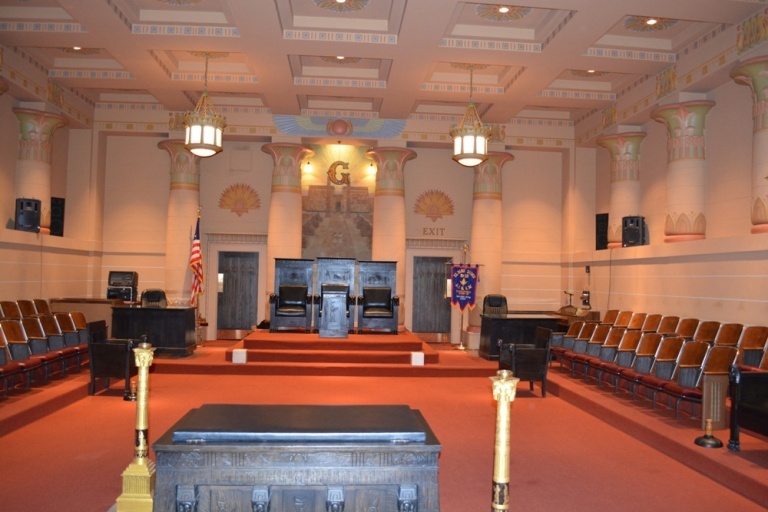 13, Colorado Springs Lodge No. 76, and Tejon Lodge No. 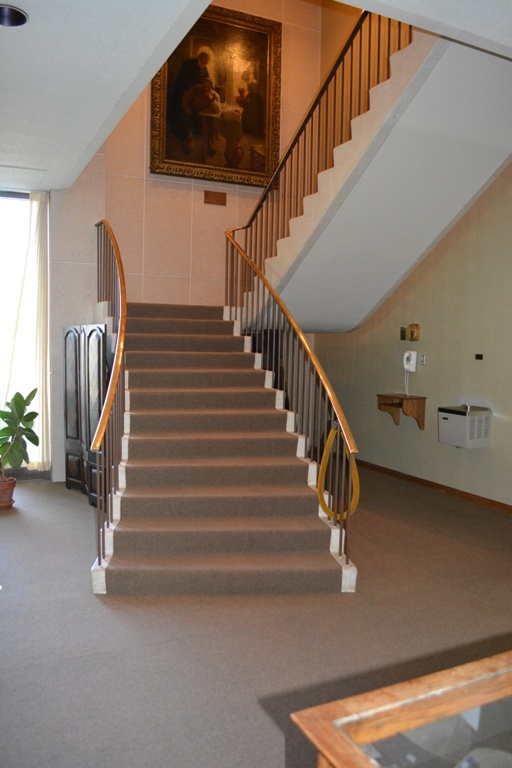 104, constitute the Colorado Springs Masonic Building Society, Inc. Each lodge is represented by three members on the nine-man board of directors of the corporation. The Board, which meets quarterly, has assigned the operation and mainte­nance of the Temple to an executive committee of three appointed by the President. The Executive Committee employs a full-time salaried Executive Director. El Paso Lodge No. 13 A.F. & A.M.
Colorado Springs Lodge No. 76 A.F. & A.M.
Tejon Lodge No. 104 A.F. & A.M.
Centennial Chapter No. 58 O.E.S. Priority of use is of course accorded the participating organizations; however, extensive use of the Temple, particularly the foyer, banquet room and food service facilities, is made by unaffiliated non-profit organizations and community groups. Each year hundreds of visitors from all parts of this country and abroad are welcomed and conducted on tours of the Temple by an Hospitality Committee of volunteers from the three Blue Lodges. Colorado Springs Masonic Square The six-acre site of the Colorado Springs Masonic Temple and the Library, Museum, and Office Building of the M.W. Grand Lodge A.F. & A.M. of Colorado has been officially named Masonic Square. This Square was dedicated to the memory of Most Worshipful Brother Leon H. Snyder, and a marble monument was unveiled here in his honor by the M.W. Grand Lodge A.F. & A.M. of Colorado on June 24, 1974. Brother Snyder, Master of El Paso Lodge No. 13 in 1946 and Grand Master of Masons in Colorado in 1961, was one of the brethren whose vision and generosity were largely responsible for the construction of the Temple. For over 100 years the offices of the M.W. Grand Lodge A.F. & A.M. of Colorado, established in 1861, occupied rented space in down­town Denver. A per-capita assessment, voted at the annual communication in 1963, resulted over the years in accumulation of funds sufficient to warrant proceeding with plans for a building of its own adequate to house the Library, Museum, and Offices of the Grand Lodge. 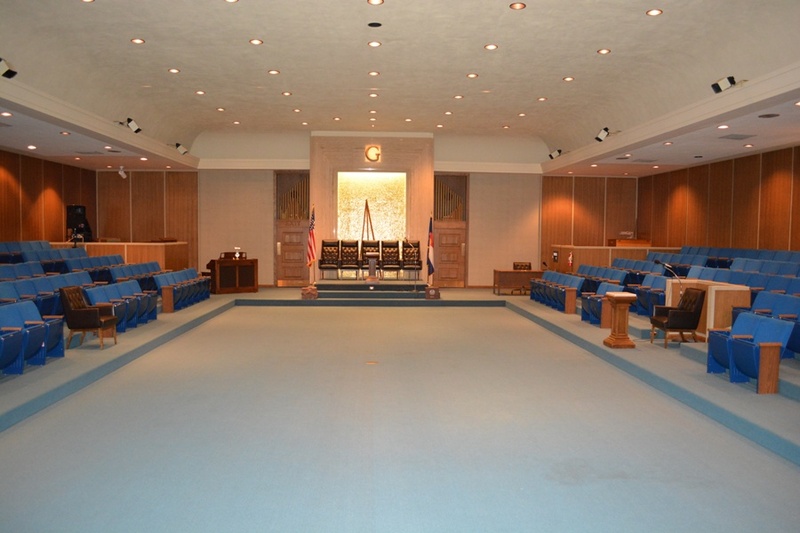 At the annual communication in 1973 the Grand Lodge voted acceptance of an offer by El Paso Lodge to lease land adjacent to the new Masonic Temple in Colorado Springs as the site for such a building and authorized the construc­tion to proceed. Cornerstone ceremonies were conducted by the M.W. Grand Lodge on December 6,1975, and construction completed and the building occupied in July 1976. 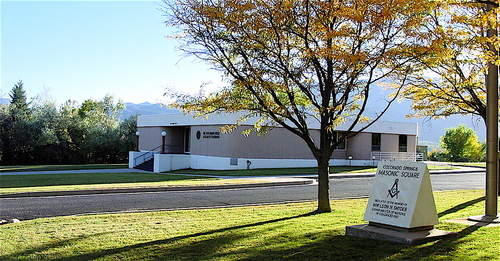 Situated near the geographical center of the State in a unique setting with majestic Pikes Peak in the background, the building is aesthetically compatible with the adjacent Masonic Temple. 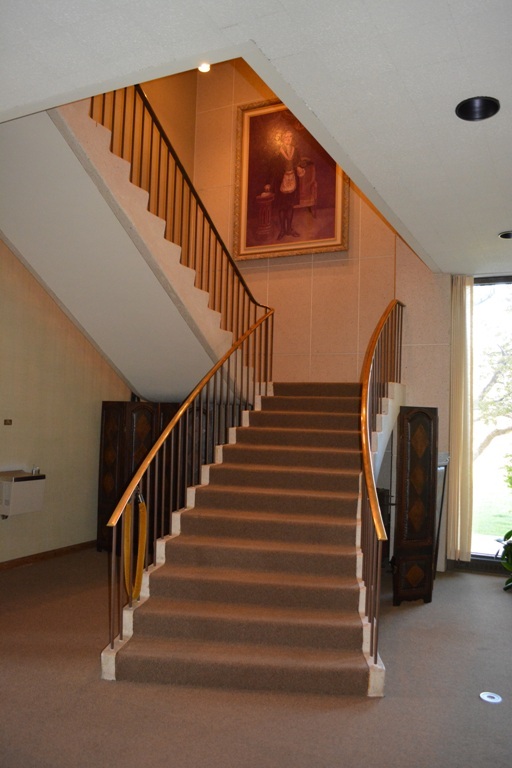 Entrance is from Panorama Drive on the east into a beautifully furnished reception room with the museum on the south and the library on the north. Offices occupy the west end of the building which terminates in an apartment for the use of the Grand Master on his numerous visits to the head­quarters of the Grand Lodge.